Learn about the Welch DryFast® Dry Vaccum Pump 2014 diaphragm pump. Includes features, pricing, reviews, and FAQs. 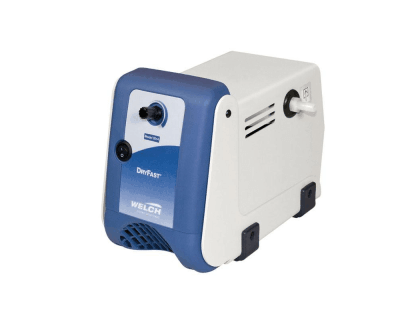 The Welch DryFast® Dry Vaccum Pump 2014 is a diaphragm pump that enables precise vacuum control for organic evaporations. The pumps are oil-free, portable, and chemical resistant, and feature Advanced Vapor Management (AVM). Perfect for high boiling point applications. Pros: Easy to operate and maintain, adjustable vacuum filtration, oil-free, and chemical resistant. Cons: Price may be costly for solo entrepreneurs. Bottomline: This one-head diaphragm pump simplifies maintenance during clean-ups or laboratory work. The Welch DryFast® Dry Vaccum Pumps 2014 retails for $1,547.69. What is the Free Air Displacement CFM of the Welch DryFast® Dry Vaccum Pump 2014? The Welch DryFast® Dry Vaccum Pump 2014 has a free air displacement CFM (l/min) @60Hz of 1.2(35). Where can I buy the Welch DryFast® Dry Vaccum Pumps 2014 diaphragm pump? 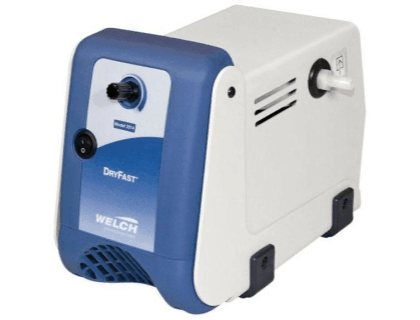 You can buy the Welch DryFast diaphragm pump by clicking on the link above, or directly from Welch. What are some Welch DryFast® Dry Vaccum Pump 2014 alternatives? Welch DryFast® Dry Vaccum Pump 2037. Welch MP 601 E Diaphragm Pump. Ace Glass 13070-07- Liquid Pump, Analog. Alemite 8323 1" Diaphragm Aluminium Pump. I like Welch brand diaphragm pumps. They can take a beating.